American disaster aid to the Philippines: America’s critics are far less generous than the United States. For all of its faults, no one comes to the world’s aid like the United States. 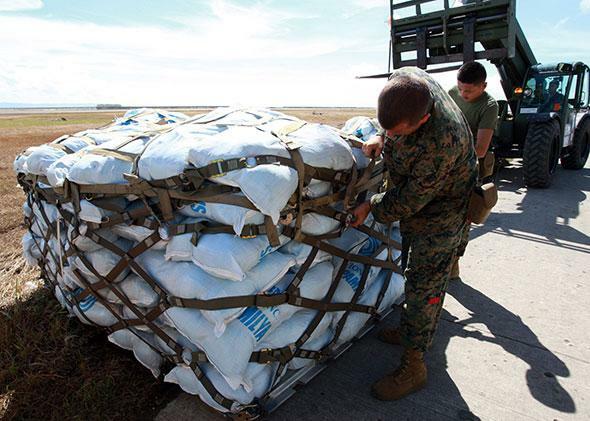 U.S. Marines prepare relief for people affected in the aftermath of Typhoon Haiyan on Nov. 13, 2013 in Tacloban, Leyte, Philippines. LONDON—In Beijing a few months ago, I met a young Filipina journalist who did video interviews for a Chinese website. She seemed clever and competent. She spoke perfect American English, which she learned growing up near a U.S. base. She was very pleased to be in China: Her job in Beijing was interesting, well-paid, and gave her a future. I asked whether she thought her career might take her to the United States. She shrugged. She would never get a visa, let alone a job. Not worth trying. At the time, I thought this conversation rather ominous. It seemed another reminder that the American dream is looking rather tarnished these days, and not only to Americans. To much of the outside world, the United States appears unpromising and unwelcoming, especially compared with the largest economy in East Asia, the new land of opportunity. We are growing far more slowly than China. Our middle class is downwardly mobile. U.S. news organizations are not scouring the world for talent, whereas China’s apparently are. American foreign policy isn’t popular at the moment either, especially among our allies. The Germans are angry because we pointlessly tapped Angela Merkel’s telephone. The Saudis are angry because we won’t join the war in Syria. President Obama’s failure to become the world savior that the Norwegian Nobel Committee so fervently expected him to be has caused widespread disappointment. And yet, when a disaster unfolds and resources have to be rapidly mobilized, it’s as if nothing has changed. One of the largest typhoons on record hit the Philippines last week. The extent of the damage isn’t yet known. But the American response is already larger—by a factor of hundreds—than that of the largest economy in East Asia. The United States is sending an aircraft carrier to the worst-hit regions and has promised $20 million in emergency aid. Millions more will be raised by U.S. charities. The British are sending a warship and $16 million. Even the Vatican has promised $4 million. And the government of China, the new land of opportunity? $100,000. There are politics behind China’s stinginess. China has recently made claims on Philippine territory, citing historical documents that date to the fifth century. The Philippine government has responded with anger, a lawsuit, and an invitation to the U.S. Navy to reopen some bases closed in the 1990s. There are also politics behind American generosity, which partly reflects the renewed warmth and military cooperation between Washington and Manila. But these differing responses to the typhoon also signify a different set of attitudes to power, and not just to “soft power”: Americans, like Europeans, have long believed that strength and wealth entail responsibility. That’s why two American ex-presidents voluntarily coordinated the international response to the 2004 tsunami, even though Indonesia was not the site of a U.S. naval base. That’s why massive amounts of U.S. aid went to victims of the 2005 earthquake in Kashmir, even though relations between the United States and Pakistan were deteriorating at the time. That’s also why an American president who is actively uninterested in engaging with the Syrian conflict has pledged more than $1 billion in humanitarian aid to Syrian refugees, accounting for nearly 30 percent of all such aid; European contributions as a whole make up a good percentage of the rest. China’s contribution, meanwhile, comes to $3 million, less than that of Luxembourg. China plays an enormous political role in Syria—the Chinese veto has helped keep the United Nations firmly sidelined there—but clearly does not feel obligated to help those affected by its decisions. The Chinese do give development aid, but differently: not in response to tragedies, not to counter disaster, but to facilitate the export of raw materials to China. There is merit to some of China’s efforts, especially in Africa. But the Chinese state is not, for the most part, interested in generosity for its own sake. Nor do many Chinese billionaires believe that new wealth brings new obligations. Several of them refused even to meet Bill Gates a few years ago, apparently because they were afraid he might ask them to give away some of their money. All of which is not an elaborate excuse for messy America foreign policy, or the still-weak American economy, or the indecisive American president. It’s just a little reminder: U.S. strength may be waning, U.S. status may be fading, and U.S. attraction for talented foreigners may soon taper off. But there will be reasons to be sorry if America isn’t a superpower anymore, perhaps more than America’s critics think.